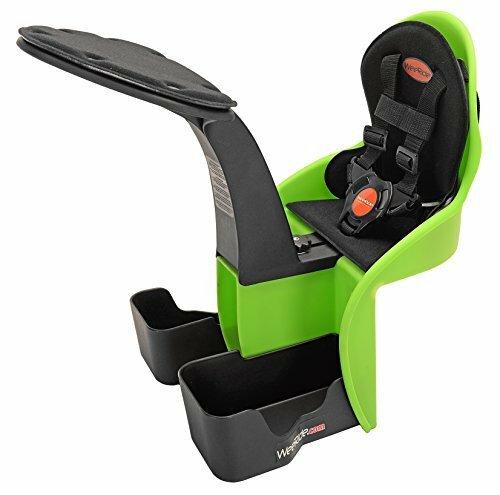 Product description the WeeRide Kangaroo center mounted child carrier offers an award-winning design that allows children to enjoy and share in the cycling experience, surrounded by your protective pair of arms. Your child is not behind you uninterested and distanced by the limited view. The child's position also keeps the center of gravity where it belongs - on the bicycle frame, not behind the rider. This all adds up to a more comfortable ride for the cyclist and the passenger. The child carrier is mounted on an independent adjustable steel support bar that attaches firmly between the frame's head tube and the seat post. The support bar is designed to mount on almost any bicycle. Customer contact information at 1-800-451-kent (5368) -- safety information - always wear a helmet, knee and elbow pads when riding. Check all nuts and bolts for tightness before riding. For casual riding on smooth, flat, paved and dry surfaces free of sand , gravel or dirt. Do not ride at night or in areas of traffic. For children up to 40lbs, if you need straps in a different size please call us at Kent international and we will have them shipped to you right away. .
Center-mounted child bike seat with safe, comfortable front-row view;Sturdy steel/plastic housing installs on almost any adult bike;Seat harness, padded front bumper and height-adjustable foot cups;Steel support bar doesn't interfere with brake cables or bike gear;For kids ages 1 year and up; maximum capacity of 33 pounds;Child's weight enhances rather than impairs your bicycle's stability. If you have any questions about this product by WeeRide, contact us by completing and submitting the form below. If you are looking for a specif part number, please include it with your message.